We all have trash cans, and I bet most of us can’t stand the way they look. I’ve recently been seeing some really nice trash can sheds pop up on the market and think it’s a great solution for the garbage cans so I decided to build one. In this step by step tutorial I show you how to build a trash can enclosure and even have a set of plans available if you want to build your own. 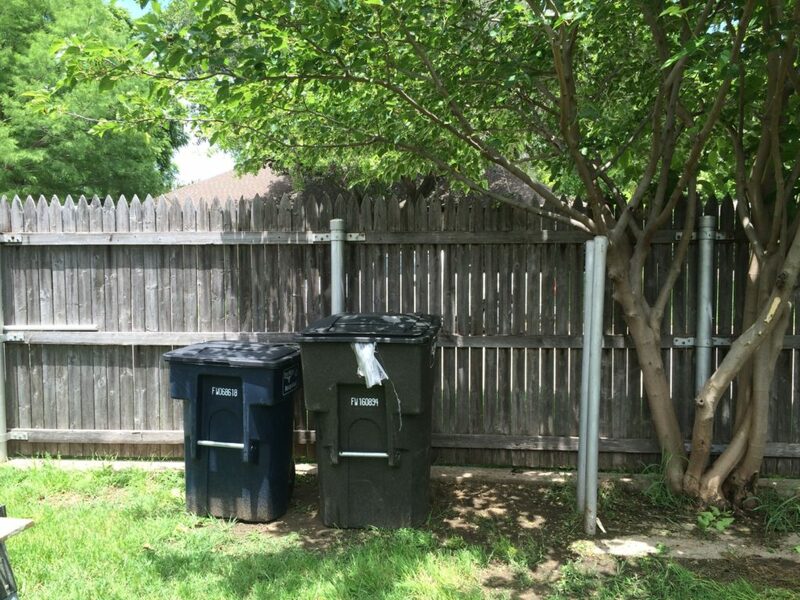 This shed allows me to store both my city issued trash can and recycling bin in the enclosure so that I can keep my backyard looking a little nicer. 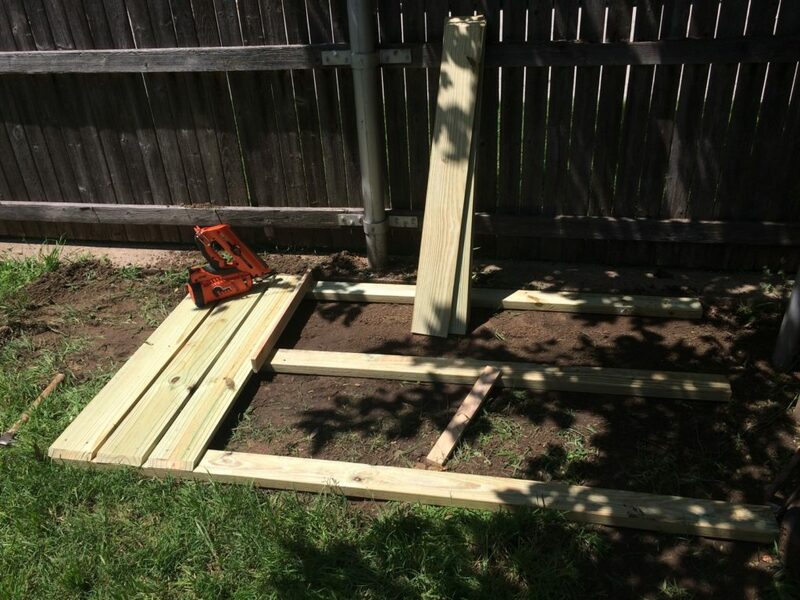 For this project I am using mostly fence pickets in order to keep the cost down. If you would like an exact material list to complete this project, I do offer a set of plans which you can find here. The first thing I did was cut a few 2x4s to length in order to use as skids. These will be what I actually build the garbage can shed on. 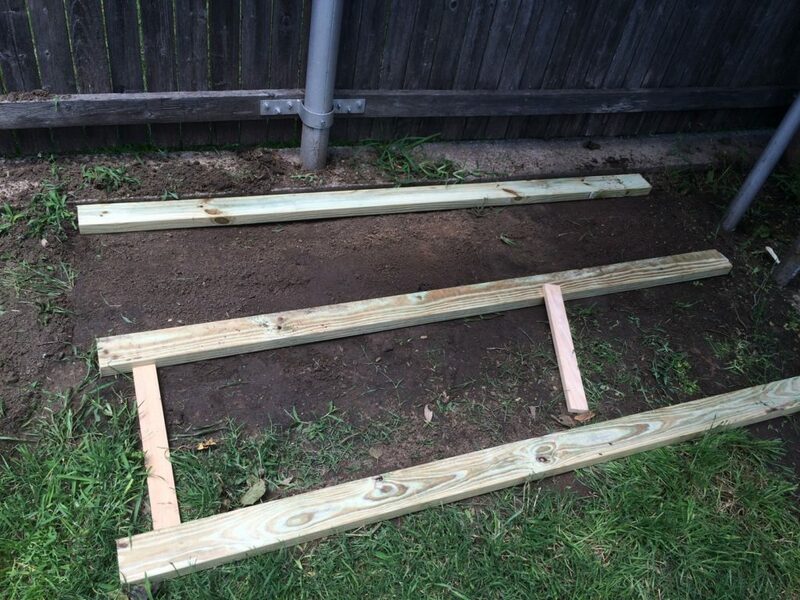 Once they were cut to length I placed them on the ground where I wanted the garbage can shed to go so I could test how level the ground was. It turns out that the ground wasn’t far off from being level, but it did need some work. I used a shovel to move some dirt around and get the ground as close to level as I could. I spaced the skids apart then started cutting the decking that will make up the base. I put a bevel on the front of each board so that it will make getting the trash cans in the enclosures easier. Tip: If you set up a work station outside with a miter saw, I highly recommend the Triton Multi Stand as a helping hand. It has a built in feature that allows you to clamp down a board to use as a stop block. With the boards cut to length I started attaching them to the skids. I used the help of a scrap board to act as a spacer to make attaching them go quicker. I would place the spacer near the back first, nail in the board, then move the spacer to the front and nail there. If you get a long enough scrap, moving the board won’t be necessary, just make sure the board you use is straight. Next I started cutting all my 2x3s to size at the miter saw. These boards will be used to frame the structure. Once all the boards were cut I started joining them to make the sides. 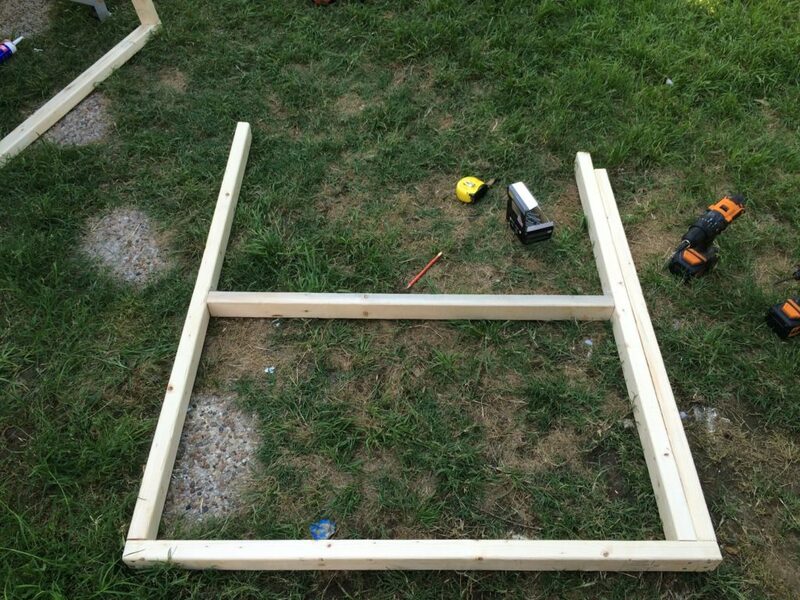 I started this project by using construction adhesive and my framing nailer, however I quickly switched to using woodglue and my drill because the nails didn’t seem to be holding my boards together as tightly as I would have liked. I don’t know if this was due to the material or nail choice or something else, but I switched to a method that I knew would work. After both the sides were constructed I attached them to the platform. Then I added in some horizontal supports. I first added a board on the bottom in the back, between the two sides. Then moved to the front and attached one to connect the sides. When adding this board I first attached it flush to the left but when I moved to the right, I placed a level on the inside of the right side to get it plumb before attaching it here. Once it was perfect straight up and down, I added screws. Alrighty, now back to the sides. I needed to add a top plate for the sides and did this by holding a board in place, flushing it up to the back, then tracing the front so I knew where to cut. : ) It isn’t cheating….well maybe a little, but it works perfect. After I cut the boards down I glued and attached them. Next I added in another cross brace along the back, this time at the very top. These I toenailed into the sides and just a tip if you do the same, it makes it easier if you pre-drill with either a countersink or a regular drill bit beforehand. Note: I later decided to add in another horizontal brace along the back, in the middle. I did this so I would have something to secure the center of the siding to and hopefully prevent some bowing. If you are replicating this project, I recommend adding the middle brace now. Then finally I added in the last framing member along the front as a top sill. This makes a nice even surface for the lids to rest on. That is, when I actually build the lids. Framing is done, now I moved to adding the siding. The siding was really simple, I cut all my pickets to the same exact height then screwed them in place. I started with the back. Then moved to the sides. Before attaching my first board on the side I did make sure that the front and back of the structure were plumb. I did this by putting a level on the front side of the front. I was slightly out of plumb so I added a temporary brace by attaching it to the bottom inside, of the side. Then moving to the top, getting the structure in plumb, then attaching the brace here as well. This will hold the enclosure in plumb while I add on the siding. For the sides, I would line the pickets up to be flush to the bottom. After the entire side was skinned then I came back to cut the tops down flush. Note: I cut down the first side by using a jigsaw, however on the second side I used a router with a flush trim bit and not only was this faster but it provided a much cleaner cut. So if you have a router and a flush trim bit then I recommend skipping the jigsaw and using it. However if you don’t have a router, then a jigsaw can work. Ok and that is where I have to stop. Rain is coming in and is expected to stick around for a few days. 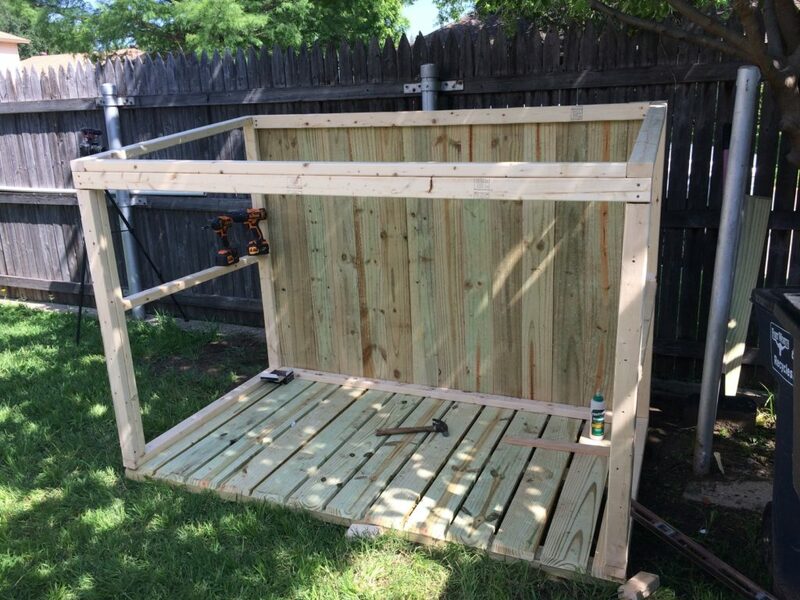 I will finish up the trash can shed next week so be sure to check back for part two! 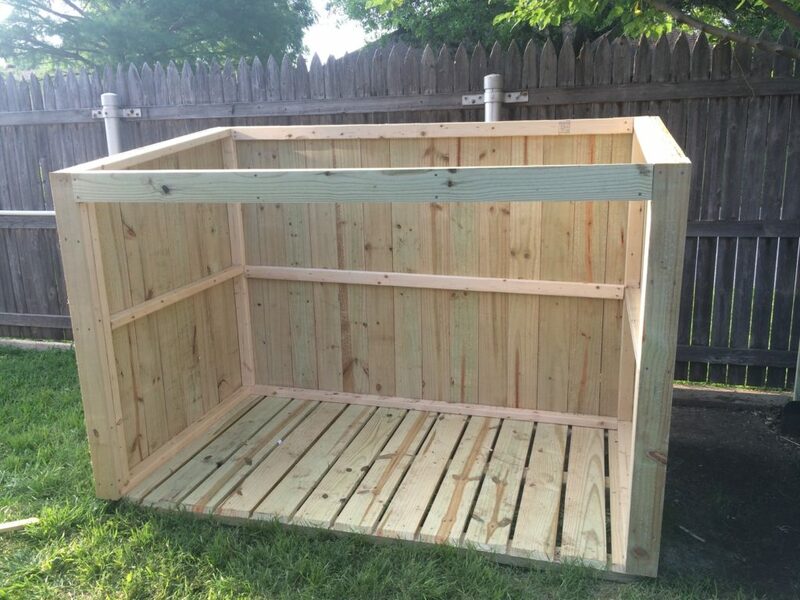 Again, if you want to build your own garbage can shed, I have a full set of plans available that includes a materials list and all the dimensions I used. Check out Part 2 of this project here!